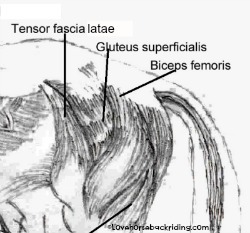 Understanding horse leg anatomy will improve your overall horsemanship. Knowing the different bones and joints of the legs and the purpose they have can help you communicate with confidence to your vet, farrier, equine massage therapist, or other equine professional. Below you can see the basic parts of the front legs on a real picture. 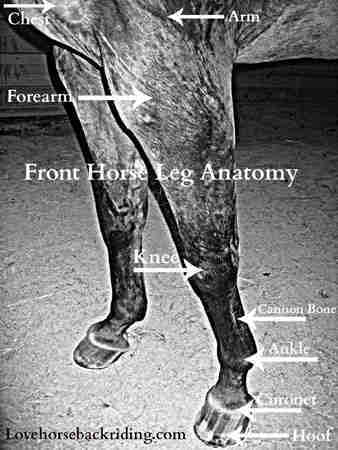 If you are interested in more of the structure and function of the front legs, check out this forelimb page, or if you want more detailed information on the hoof go to this page. In this article I am going to explain more of the in depth structure and function of the hind leg anatomy. Below you'll some basics of the hind limb. If you aren't familiar with them, or if you want to see them in relation to the whole body you can check out this page on body parts. I have explained each of these there. The majority of the power of movement should come from the rear legs. The horse leg anatomy in the rear includes the bones of the pelvis (the ilium, ischium and pubic bones), femur, tibia, fibula, metatarsus and the phalanxes. 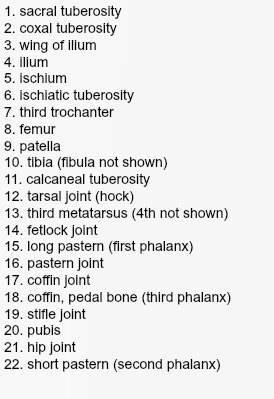 #19-The stifle is the largest single joint in the body. One of it's main functions is to cause the rear leg to become stiff when the foot is on the ground. This is controlled by the stay apparatus, which is similar to our own kneecap. 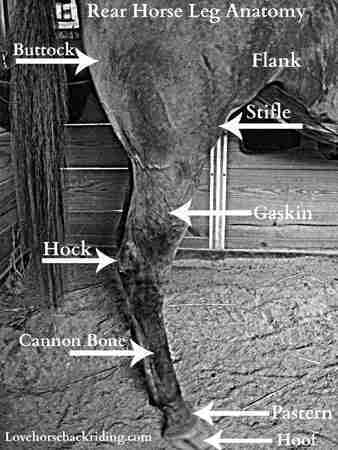 #12- The hock is arguably the most important joint of horse leg anatomy. Good hocks are what should transmit the propelling force to move the body forward. They can take quite a beating in western disciplines such as reining and cutting where the horse works mainly off the hind end. This puts a lot of torque on the joint which can later turn into arthritis. That is just one example, the hocks are come under stress in many disciplines. Properly conditioned muscles along with good conformation on the hind end will increase the longevity of your horse. If he uses his hind end to propel himself and is light on the forehand, it will reduce his risk of lameness. If he mainly travels "on the forehand" it can set him up for future lameness. You want more of his weight to be on the hind legs where the powerful loin and buttock muscles are. This is done through proper training exercises and good rider mechanics. Keep in mind there are layers of muscles. This picture only shows those closest to the skin, or superficial muscles. Leave horse leg anatomy and go find other fun articles about care, training, and natural horsemanship.